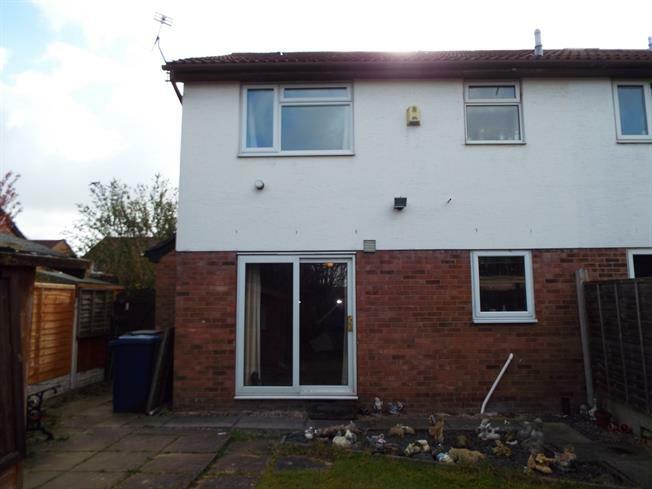 1 Bedroom Semi Detached House For Sale in Preston for Asking Price £70,000. NO CHAIN Modern quarter house, vestibule, good sized lounge with gas fire, fitted kitchen, double sized bedroom, three piece bathroom suite, double glazed windows, detached garage and stone flagged driveway, approximately 30 foot long rear garden is laid to lawn with stone flagged patio area with blue slate chipping section, garden shed. This property is in need of modernisation. Will attract Investors and First Time Buyers..
Good sized Lounge with tiled fireplace housing gas fire. Sliding patio doors open onto the rear garden. Double doors leads to Kitchen. A range of wall and base units with contrasting work surfaces. Inset stainless steel single drainer sink unit. Built-in electric oven with four ring gas hob and extractor fan. Space for fridge and space for washing machine. Part tiled walls and vinyl floor. Double glazed window to the rear elevation. Loft access point. Built-in linen cupboard and built-in storage cupboard. Well proportioned double sized bedroom with double glazed window to the rear elevation. Gas wall heater. Wall mounted multi-point hot water boiler. Three piece bathroom suite consisting of panelled bath, pedestal wash hand basin and low level WC. Part tiled walls.